These innovative dog chew products (known as Dura Chews) made by Nylabone are magnificently shaped as chewable dinosaurs. Nylabone designed these long lasting, fun dog chews for powerful canine chewers, thus making them suitable for dogs up to 50lbs in weight. 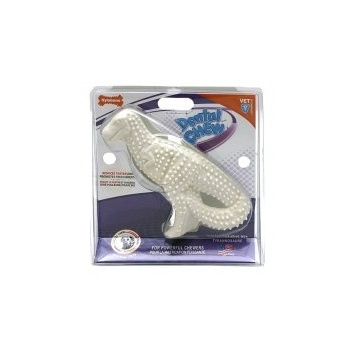 Their unique shape not only makes it a real pleasure for any dog to satisfy its instinctive canine chewing needs, but they also clean your dogs teeth with their gently rounded dental nubs and bristles all at the same time. If your dog is not being fed on a raw diet, but a complete dry food diet, then one of these dura dog chews is essential to keep that sparkling white doggy smile, as your dog eagerly greets you at your front door. Plaque build-up is associated with gum problems in dogs and must be kept under control. So not only are you treating your dog's chewing needs, you are also handing him his very own dinosaur shaped dog toothbrush! This saves you time as an owner, as there no longer is a need to brush your dog's teeth with a mini canine toothbrush - especially as most dogs run at the sight of them. Your alternative is giving your dog a knuckle bone treat to crunch on, but these are not only messy and greasy, but can also upset your dog's tummy, as the freshness is never a guarantee. However, Nylabone's edible dog chews have a shelf life of over 5 years and only need to be replaced if the dog chew becomes too small for your dog to chew safely. An innovative dog product indeed! As you can see, this truly is a "Love & Care" dog product, which will be met with waggy tails across the world - love, treat, care and reward your dog all in one with a Nylabone Dura Dog Chew available in the marvelous shape of either a T-Rex, a Brontosaurus or of course a glorious Stegosaurus. Who said dinosaurs were extinct? !